Each year, SFU selects two Aboriginal graduate students to receive Graduate Aboriginal Entrance Scholarships worth up to $54,000 each over three years. The award criteria stipulates that candidates must have Aboriginal ancestry, a minimum grade-point average of 3.5 (out of a possible 4.0), and have demonstrated outstanding achievement, with particular emphasis on intellectual ability, originality and ability in research. The successful applicants for the 2013 scholarships were graduate students Kyle Bobiwash and Nicole Muir, whose research aims to help others. Both Bobiwash and Muir are active members in the First Nations Student Association and are amazing role models for Indigenous students on campus. Kyle Bobiwash, of the Mississauga First Nation, is using his three-year, $54,000 SFU Graduate Aboriginal Entrance scholarship to further his PhD research into enhancing blueberry pollination. Bobiwash has been interested in science since his early childhood when he scoured swamps and creeks near his home to collect aquatic animals and plants. During his undergraduate degree, he conducted the first analysis of the diverse public health-delivery models among First Nations in Canada. He then went on to analyze the delivery and outcomes of the Aboriginal Diabetes Initiative across Canada, to support the program's renewal. He eventually combined his love of the outdoors with science at the Cool Climate Oenology and Viticulture Institute in Southern Ontario. There he blended agriculture, chemistry, entomology and ecology while working alongside winemakers and grape farmers from around the globe. Bobiwash discovered an interest in blueberry pollination during work for his master’s degree at McGill University. He was exploring how to manage multiple blueberry pollinator species, such as honeybees, bumble bees and leafcutter bees in the fields to increase yield. He chose SFU for his PhD because bee expert Elizabeth Elle, professor of biological sciences, also has an interest in transferring knowledge to the public. Together, they’re working with local farmers to determine how enhancing farm habitat and agricultural management techniques can improve blueberry pollination. “Pollinators are declining globally, so designing farm systems that encourage pollinator diversity and provide multiple year-round resources for bees is important, says Bobiwash. Since B.C. 's blueberry crop is the second largest by region in the world, his research has the potential to help B.C.’s farming community and economy. "Incorporating natural habitat, such as wildflowers and flowering shrubs within and around fields, will be key for agriculture going forward,” says Bobiwash. Originally published October 16, 2013 in the SFU Graduate Studies blog. SFU is proud to award our second Graduate Aboriginal Entrance PhD Scholarship to Kyle Bobiwash, of the Mississauga First Nation. Kyle Bobiwash says, "My interest in science started at a young age, when I would scour the swamps and creeks near my home to collect aquatic animals and plants to raise in any watertight container I could get my hands on." During his undergraduate degree, he conducted the first-ever analysis of the diverse public health delivery models among first nations in Canada. He then went on to analyze the delivery and outcomes of the Aboriginal Diabetes Initiative across Canada to support the program's renewal. He eventually found a way to combine his love of the outdoors with science at the Cool Climate Oenology and Viticulture Institute in Southern Ontario. There he had the opportunity to blend agriculture, chemistry, entomology and ecology while working alongside winemakers and grape farmers from around the globe. Kyle's master's degree research looked at blueberry pollination and the use of multiple managed pollinators in fields to increase yield. He discovered that there was significant inbreeding in the New Brunswick fields as well as deleterious mutations accumulating in the plants. These findings may prove insightful to the movement towards using perennial plants in agriculture, revealing potential risks with the use of long lived plants. There was also another practical application: The peak flowering periods were tracked and reported back to the farmers, who could make best use of that data to bring in pollinators to ensure larger berry crops. At SFU, Kyle will be working with Dr. Elizabeth Elle, Biological Sciences, to investigate how enhancing farm habitat and agricultural management techniques might improve Highbush blueberry pollination and other ecosystem services. Since BC's blueberry crop is the largest production by region in the world, his research has great potential to help our local farming community and our province's economy. Kyle says, "incorporating natural habitat into farm systems will be key for agriculture going forward." He adds, "school might not always be this fun but loving my research area, having an awesome lab group and being in a beautiful region will surely get me through the days of hard work ahead." Nicole Muir, a member of the Métis Nation of Saskatchewan, earned bachelor degrees in both arts and education years ago, but then found she didn’t want to work in a classroom. Instead, she spent more than 15 years as a resource worker, youth worker and traditional counselor with Aboriginal communities across Canada. She quit her job and returned to York University to study psychology. For her honours thesis, she interviewed two elders and a grandmother about traditional Aboriginal child-rearing practices. At SFU, Muir is using her $30,000 two-year graduate entrance scholarship to investigate and address gaps in clinical care for Aboriginal children in the foster-care system. She worries that mainstream assessment tools may not be capturing healthy Aboriginal parenting practices such as the concept of children’s autonomy found in some Aboriginal cultures. It teaches children to listen to their bodies: to eat when they are hungry and sleep when they are tired, rather than adhering to the set schedules or routines typically found in non-Aboriginal families. It’s a practice, says Muir that helps children build and strengthen their spirit. Muir plans to use her knowledge of both traditional Aboriginal healing methods, and western research in mental health and parenting, to build bridges between Aboriginal youth in foster care and the current mainstream services. She is studying under Ronald Roesch, professor of psychology and director of the Mental Health, Law and Policy Institute at SFU. Working with Roesch, she says, will add depth to her studies because so many decisions about Aboriginal youth and children are made in the court system. "With the support and guidance of the Aboriginal community I’m really interested in doing pragmatic research that focuses on strengths,” says Muir, “because much of the research that has been done in the past with Aboriginal communities has been deficit-based." 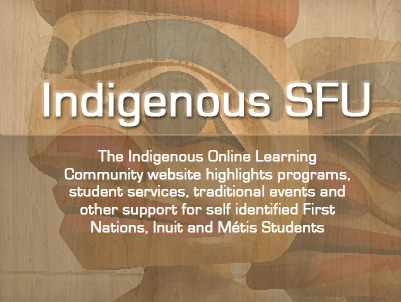 Originally published November 12, 2013 in the SFU Graduate Studies blog. Three years ago, Nicole quit her job and went back to York University to study psychology. For her Honour’s Thesis, she interviewed two Elders and a Grandmother on traditional Aboriginal child rearing practices. Her research goal is to investigate and address gaps in clinical care for Aboriginal children who are in the foster care system. It's a goal that addresses a dire need as so many Aboriginal children in Canada are currently in foster care. Nicole feels that mainstream assessment tools might not be capturing healthy Aboriginal parenting practices. She says she is "really interested in talking to the children and youth themselves to learn about what the children want and need while they are in foster care because this has not been done." Because Nicole has knowledge of both traditional Aboriginal healing methods and western research in mental health and parenting, she will work to build bridges between Aboriginal children and youth in foster care and the current mainstream services. One of her previous supervisors commented that "I think that Nicole has the potential to make a major difference in bridging the gaps between academia and Aboriginal community needs." Nicole will be studying with Dr. Ronald Roesch in the Department of Psychology, where they have a strong clinical program. Nicole feels that working with Dr. Roesch in the forensic stream really adds depth to her area of study because so many decisions about Aboriginal children and youth are made in the court system.